George Graham Reviews The Siegel-Schwall Band's "Flash Forward"
Unlike rock and pop performers, many of whom end up being flashes in the pan, blues artists tend to be in it for the long haul. And blues is one of those genres like jazz and classical music in which performers tend to get better as they get older. B.B. King marked his 80th birthday this month, and pianist Pinetop Perkins has remained active into his 90s. This week we have a new CD marking a reunion of one of the near legendary blues groups that emerged from Chicago in the 1960s, the Siegel-Schwall Band, whose new CD is called Flash Forward. Corky Siegel and Jim Schwall first met in 1964 when they were both in the jazz band at Roosevelt University. They soon found that they had a common interest in the blues, began performing as a duo, and landed a regular gig at Pepper's Lounge on Chicago's South Side. There they joined and became friends with such Chicago blues pioneers as Muddy Waters, Howlin' Wolf, Willie Dixon, James Cotton and Junior Wells. As a couple of white college kids, Siegel and Schwall were a kind of American counterpart to the young British blues performers on the other side of the Atlantic and were part of a scene which also included the Paul Butterfield Blues Band and Mike Bloomfield's groups. The Siegel-Schwall Band were signed to Vanguard Records, the label that was the home of a lot of 1960s folk and blues performers, and released their debut album in 1966, which immediately began to attract attention. One of the band's fans in the blues clubs of Chicago turned out to be Seiji Ozawa, the young conductor of the Chicago Symphony Orchestra. Ozawa was interested in the possibilities of combining blues with orchestral music, and after inviting the band to jam with the symphony, commissioned composer William Russo to create Three Pieces for Symphony Orchestra and Blues Band, which was a huge success, and in the early 1970s became the biggest-selling classical album. The Siegel-Schwall Band, with bassist Rollo Radford and a succession of drummers, before settling on Sam Lay, toured and recorded extensively until 1974, when they went their separate ways. The band reunited for an album in 1987. In the intervening time, Corky Siegel continued experimenting with mixing blues and classical. He recorded another work by William Russo again with Seiji Ozawa, and in the 1990s, launched the delightful group Corky Siegel's Chamber Blues, combining a string quarter, Indian tabla and other percussion, with Siegel's harmonica. He also composed music for films and TV, such as the Carl Sagan "Cosmos" series on PBS-TV, and for TV coverage of the 1988 Olympics. Jim Schwall also pursued classical influence, getting a Ph.D. in music. He also became something of a political activist, and ran for mayor in Madison, Wisconsin. Rollo Radford performed with everyone from Dinah Washington and Chuck Berry to jazz iconoclast Sun Ra. Sam Lay has been the epitome of the studio drummer, performing with blues greats like Muddy Waters, and also appearing as part of Bob Dylan's band in at the famous 1965 Newport Folk Festival, when Dylan went electric. Though the Siegel-Schwall Band was known for their tasteful playing, and the trademark harmonica work of Corky Siegel, the quartet was known just as much for their good-natured outlook and spirit of fun as for any flashy playing or extended solos. That tradition continues on their new CD, their first full album of new material in thirty years. Flash Forward is replete with witty lyrics by all four members of the band, and their eclectic approach to the blues with a combination of electric and acoustic instrumentation. It also marks Sam Lay's debut as a songwriter and vocalist. All four members take turns as lead singer on their respective compositions. As usual, the band is mainly self-contained on the CD, though they are joined by two backing vocalists, Marcy Levy and Holly Siegel. With their decades apart, the Siegel-Schwall Band is by now not the tightest musical machine on the planet, but that is more than compensated for by the tangible fun and spirit of camaraderie the members are obviously enjoying. It's quite infectious, and it's a characteristic that has marked the band's music over the years. It's blues that makes you feel good. The Siegel Schwall Band is one of the more durable blues associations, though in an interrupted way with extended periods apart. This latest reunion CD, the first by the whole band since 1987, is a fun record whose main audience will likely be long-time fans of the group who may remember them from the 1960s and Seventies. The distinguishing characteristics that set them apart then do so again. There is worthy musicianship, with perhaps their musical interactions not being quite as tight as they were when they played together constantly, and a sense of fun in the lyrics. These are four guys who are long-time friends getting together to make music that they greatly enjoy, and that is very much evident in this CD. The recording also has a healthy dose of eclecticism, with some unexpected twists both musically and lyrically. Our grade for sound quality is about an A-Minus. The recording has the honest, unpretentious sound typical of the musical direction of the band, without a lot of slickness. But as is too often the case, there is excessive volume compression in the CD, sucking out some of the dynamics of the performances. 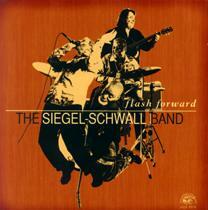 If you are a long-time fan of the Siegel-Schwall band, then Flash Forward is a CD you won't want to miss. It's also a fun way to get to get to know this durable and spirited band.